The Semi Olympus II (セミ・オリンパス・Ⅱ型) is a 4.5×6cm folder, made from 1937 by Takachiho (later Olympus). It was the first camera entirely made by the company, after the Semi Olympus whose body was bought elsewhere. It was succeeded in 1940 by the Olympus Six, which was first announced as the Semi Olympus III, despite its different 6×6cm format. The Semi Olympus II is a horizontal folder taking 4.5×6cm pictures. The body was designed by Mr Kitagawa (北川). The folding struts are the same as on the Balda products, certainly under the influence of the previous Semi Olympus. The camera normally has a tubular viewfinder. The advance knob is at the left end of the top plate, as seen by the photographer, and there is an accessory shoe at the right end. The serial number is engraved in the advance knob, together with an arrow indicating the winding direction. The back is hinged to the left and the back latch is covered by a leather handle; there are two red windows at the bottom to control the film advance, covered by a black plate pivoting on an axis in the middle. The bottom of the camera has two film flanges, with the shape of a truncated cone; one has a 1/4″ tripod thread and the other has a 3/8″ thread. The OLYMPUS TOKYO logo is embossed at three places: on the front door, in the back above the red windows, and in the handle. The lens is the same Zuiko 75/4.5 as on the previous Semi Olympus. The Semi Olympus II was advertised in Asahi Camera from October 1937 to March 1940, and it was featured in the January 1938 issue of the same magazine. The first version of the camera is pictured in advertisements from October 1937 to February 1938 and in a brochure dated 1937. The viewfinder is offset to the left (as seen by the photographer) and the folding bed release is in the middle of the top plate. In the documents, the shutter is called Laurel (ローレル, rōreru) and is said to give 1–150, B, T speeds with a self-timer. The name LAUREL is engraved at the base of the speed rim. The shutter plate is inscribed OLYMPUS-TOKYO-N at the top and the aperture scale is at the bottom. No surviving example has been observed with the offset finder and the Laurel shutter, and it is not clear whether this version was actually sold. Takatiho Tôkyô Zuikô 1:4,5 f=75mm lens marking. In the October 1937 advertisement in Asahi Camera, reproduced below, no price is given and the camera is presented together with the Olympus Standard; Misuzu Shōkai and Yamashita Yūjirō Shōten are given as authorized dealers for the Standard, and it is unclear whether this applies to the Semi II as well. The picture shows the lens marking Takatiho Tôkyô Zuikô 1:4,5 f=75mm No.xxxx, typical of the very first lenses made by the company, as found on the Semi Olympus (I) with serial numbers in the 10xx or 11xx range. The advertisement that appears in the November and December issues of the same magazine shows a photograph of the camera taken from a slightly different angle, with a similar lens marking. In the document, the camera is priced at ¥95, and Misuzu and Yamashita are named as distributors for the Standard, but no distributor is mentioned for the Semi II. In the full-page advertisement for the Semi Olympus II placed in the January 1938 issue, the Laurel shutter is stated to be designed by Takachiho based on the Prontor II shutter, and Yamashita is given as the distributor. The photograph shows a different example of the Semi Olympus II, with lens marking Zuikô 1:4,5 f=75mm Takatiho Tokyo No.xxxx. This marking, with focal length in millimetres, is intermediate between that found on the Semi Olympus (I) and that found on regular examples of the Semi Olympus II. The advertisement in the February issue is revised: the distributors are now Yamashita and Mizuno Shashinki-ten. The picture is taken from a similar angle but is not identical; it shows a camera with similar features. Zuikô 1:4,5 f=75mm Takatiho Tokyo lens marking. The camera was announced in the new products column of the January issue, reproduced below. The document mentions the offset viewfinder and the accessory shoe for a rangefinder or a flashgun. It says that the Laurel shutter is everset, but this is clearly a mistake. Semi Olympus II, regular version, shutter name not visible, body number is perhaps 1072. The advertisement in the March 1938 issue of Asahi Camera is the first in that magazine to show the regular version, with the tubular finder in the middle of the top plate and the folding bed release on the right. That in the April issue at first looks the same, but there is no mention of the shutter (which is anyway not shown in the photograph of the camera). The two documents show the same picture; the camera's body number is barely legible as 1072. One of the pictures in the May 1938 advertisement in Asahi Camera shows a number of cameras from a distance (at least twenty), indicating that the serial production of the camera bodies had begun. In another picture showing a camera from a closer distance, the shutter rim reads DAURED (or possibly DAUREL). This marking probably results from a retouch applied on the photograph, and it seems unlikely that any actual camera was engraved as such. It is said that the Laurel name was dropped because it was already registered by another company, and the "Daured" retouch was certainly the result of a hasty move. On the same camera, the shutter has speeds of 1–150, B, T, and the lens number is legible as 1448 (or maybe 1446). The lens number indicates that less than 500 examples of the Semi Olympus and Semi Olympus II were made up to Spring 1938. It seems that the lens marking is now Zuikô 1:4,5 f=7.5cm Takatiho Tokyo, with focal length in centimetres. Semi Olympus II, regular version, Laurel shutter, retouched as "Daured". Leaflet by the retailer Photo News, November 1938. The advertisement in the June 1938 issue of Asahi Camera shows the new shutter name Koho (コーホー), both in the text and on the photograph. The pictured camera has a focal length in centimetres, as all later Semi Olympus II. The advertisement shows a mountain and a country road, with the catch-phrase "[Let's go] gallantly to the green mountains and fields" (緑の山野に颯爽と! ), an allusion to the season and perhaps to the camera name Olympus and shutter name Kōhō (meaning "high peak" or "high mountain"). The company Honjō Shōkai has been added to the list of authorized dealers and the price is still given as ¥95. In advertisements dated July and September 1938, January, February and October 1939, the price has raised to ¥105 and the company Hinode Kōgyō is gradually replacing the three authorized dealers to become the sole distributor. The top speed is given as 1/150 in all these advertisements. The September 1938 advertisement in Asahi Camera makes it clear that "the Semi Olympus [II] is a camera by Takachiho, that was produced with the purpose of popularizing the Zuikō [lens]". Incidentally, in all the advertisements for the Semi Olympus II, the lens is called 瑞光 ("Zuikō") in kanji script whereas the shutter is called コーホー ("Kōhō") in katakana script. The same features and price appear in the leaflet reproduced on the right, published by the retailer Photo News Sha in November 1938, and in two undated brochures reproduced in the official Olympus history website. These documents specify that the price of ¥105 comprised a lens hood and a cable release. Serial numbers are sometimes legible in the documents. The picture used in most magazine advertisements from July 1938 onwards shows lens no.1622 (legible in the September 1938 issue of Asahi Camera). One of the brochures shows a different camera with lens no.1675 or 1678. The two cameras used for these photographs were among the first with a Koho shutter, and were made no earlier than Spring 1938. Finally, the leaflet by Photo News, printed a few months later, shows lens no.1982. Advertisements for the Semi Olympus II were placed in Asahi Camera until the March 1940 issue. The camera still appears in the official list of set prices compiled in October 1940 and published in January 1941, at ¥121. It is also mentioned in a similar price list dated November 1941, for an unknown price. The Olympus Six was already available for sale at that time, and the observed serial numbers seem to indicate that there was no overlap in the production of the two models. It is thus presumed that these set prices applied to the remaining stocks of the Semi Olympus II, held by the company or by the retailers. A single surviving camera is known with a Laurel shutter; it has body no.1063, and lens no.1221, and was pictured in an issue of Camera Collectors' News. It is very likely that the sequence of body serial numbers started at 1001, a common practice among Japanese manufacturers of the time, whereas the sequence of lens numbers continues that of the Zuiko lens mounted on the Semi Olympus. Body no.1063 is slightly earlier than no.1072 with centred tubular finder visible in the March and April 1938 advertisements in Asahi Camera. The camera differs from the models described above by its folding optical finder, centred on the top plate. It was examined by Awano Mikio, editor-in-chief of Camera Collectors' News, who said that the finder looked genuine, but the possibility that it was exchanged at some time cannot be discarded. The folding bed release is at the same position as on regular cameras with centred tubular finder. The Laurel shutter gives 1–150, B, T speeds, and looks the same as the Koho, but for the name LAUREL engraved on the speed rim. The lens bezel reads Zuikô 1:4,5 f=75mm Takatiho Tokyo No.xxxx with focal length in millimetres, as in the advertisements dated early 1938. The comparison of body and lens numbers might hint that about 160 Zuiko lenses were made for the Semi Olympus before the company switched to the model II. However this subtraction should be handled with care, because the lenses were not fitted to the camera bodies in strictly ascending order. Semi Olympus II no.5182, Zuikô 7.5cm f/4.5 lens no.3620, Koho shutter to 1/150. All the other examples of the Semi Olympus II observed so far have the viewfinder centred above the top plate and a Koho shutter. The early examples have 1–150, B, T speeds. The lowest numbers reported so far on a surviving example with Koho shutter are body no.1315 and lens no.1790. Koho shutter to 1/200, no T setting. An example is known with a folding optical finder centred above the top plate, instead of the tubular finder. The part is different from that found on the camera with Laurel shutter, and is probably not original. On all the Semi Olympus II observed with Koho shutter, the lens engraving has a focal length in centimetres. It reads Zuikô 1:4,5 f=7.5cm Takatiho Tokyo No.xxxx (with circunflex accent) up to lens no.3797 and Zuiko 1:4,5 f=7.5cm Takatiho Tokyo No.xxxx (with no accent) from lens no.5253. Semi Olympus II no.5696, Zuiko 7.5cm f/4.5 lens no.5x94, Koho shutter to 1/200. Later examples have 1–200, B, T speeds, with no other change. The last known example with 1/150 top speed has body no.5368 and lens no.5253, and the earliest known example with 1/200 has body no.5362 and lens no.5389. The different parts constituting the camera (body, shutter and lens) were not used in strict sequence, explaining the small overlap in the body numbers. One isolated example, pictured in this page, is known with 1–200, B speeds and no T setting. It has body no.6641 and lens no.6168 — the body number is the highest observed so far on a Semi Olympus II. Semi Olympus II no.6641, Zuiko 7.5cm f/4.5 lens no.6168, Koho shutter to 1/200, no T setting. Finally, a camera has been exhibited by the Korean branch of the Olympus company in 2008 and 2009. It has lens no.6257, the highest known on a Semi Olympus II, and a Koho shutter to 1/200 with T setting. Its viewfinder is not original, and was taken from an Olympus Chrome Six. ↑ Brochure (part 1 and part 2) reproduced in the medium format page of the Olympus official website. It has a sticker indicating a price of ¥105. ↑ Advertisement in Asahi Camera October 1937, p.A59, also reproduced in Kokusan kamera no rekishi, p.62, and in Hibi, p.62 of Kurashikku Kamera Senka no.8. ↑ Advertisements in Asahi Camera November 1937, p.A54, and December 1937, p.A52. ↑ Advertisement in Asahi Camera January 1938, p.A54. ↑ Column in Asahi Camera January 1938, p. Kokusan kamera no rekishi, p.335. ↑ Advertisement in Asahi Camera March 1938, p.A52. ↑ Advertisement in Asahi Camera April 1938, p.A50. 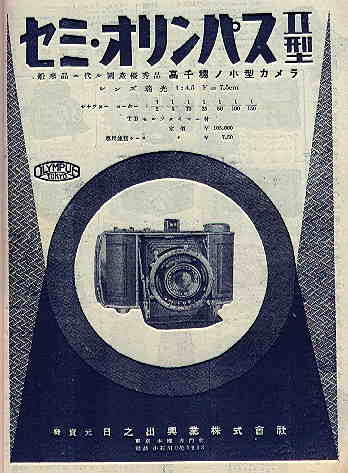 ↑ Advertisement in Asahi Camera May 1938, p.A52, also reproduced in Hibi, p.62 of Kurashikku Kamera Senka no.8. ↑ Advertisement in Asahi Camera June 1938, p.A50, also reproduced in Kokusan kamera no rekishi, p.62, and in Hibi, p.62 of Kurashikku Kamera Senka no.8. ↑ Advertisement in Ars Camera July 1938, reproduced in Hagiya, p.10 of Kurashikku Kamera Senka no.20. — Advertisement in Asahi Camera September 1938, p.A46, also reproduced at Gochamaze and in Hibi, p.63 of Kurashikku Kamera Senka no.8. — Advertisement in Asahi Camera January 1939, p.A55. — Advertisement in Asahi Graph, 8 February 1939, reproduced at Gochamaze. — Advertisement in Asahi Camera October 1939, reproduced in this page at Heiki Seikatsu. ↑ 18.0 18.1 Undated leaflet by Photo News, reproduced in this article. ↑ First brochure (part 1 and part 2) and second brochure (part 1 and part 2) reproduced in the medium format page of the Olympus official website. ↑ The picture is known to appear in the following advertisements: Ars Camera July 1938, Asahi Camera September 1938, January 1939, and October 1939. ↑ Lens no.1675 or 1678 legible on this page. ↑ If cameras with Koho shutters were ready to be photographed for publication in May 1938, the company would not have used the "Daured" name in the advertisement placed that month in Asahi Camera. ↑ "Kokusan shashinki no kōtei kakaku", type 3, section 6B. ↑ "Kamera no kōtei kakaku kanpō happyō", November 1941, type 3, section 6B. ↑ Example pictured in Awano, Camera Collectors' News no.209. ↑ Awano, p.2 of Camera Collectors' News no.209: "It might have been replaced on some occasion, but as far as I can see nothing looks suspicious, it has some rust and looks like it was there from the beginning." Original quote: 何かの事情で取替えられてしまったのかもしれませんが、見たところ不自然な様子はなく錆の出具合など元からのもののように見えます. ↑ Example reported by J. Foster. ↑ Example picture in Hibi, p.63 of Kurashikku Kamera Senka no.8, in Shunkan o torae-tsuzukeru shattā-ten, p.21 and in Omoide no supuringu-kamera-ten, p.23. ↑ Lens no.3797: example pictured in Francesch, p.58, in Sugiyama, item 1215, in Hagiya, p.14 of Kurashikku Kamera Senka no.20 and in this page of the Olympus Photo Club. Lens no.5253 (body no.5368): example pictured in Hagiya, p.14 of Kurashikku Kamera Senka no.20. ↑ Body no.5368, lens no.5253: example pictured in Hagiya, p.14 of Kurashikku Kamera Senka no.20. Body no.5362, lens no.5389: example observed in an online auction. ↑ News report from Aving, and other news report showing the camera exhibited at the 2009 Photo & Imaging camera show in Seoul. Semi-Olympus, dated 1937. Document reproduced (part 1 and part 2) in the medium format page of the Olympus official website. Semi Orinpasu II-gata (セミオリンパスⅡ型, "Semi Olympus II"), date c.1938. Document reproduced (part 1 and part 2) in the medium format page of the Olympus official website. Semi Orinpasu II-gata (セミオリンパスⅡ型, "Semi Olympus II"), date c.1938, different layout. Document reproduced (part 1 and part 2) in the medium format page of the Olympus official website. "Kamera no kōtei kakaku kanpō happyō" (カメラの公定価格官報発表, Official announcement of the set prices of the cameras), November 1941. Extract of a table listing Japanese camera production and setting the retail prices, reproduced in "Bebī Semi Fāsuto 'Kore ha bebī wo nanotta semi-ki da'" (ベビーセミファースト"これはベビーを名乗ったセミ機だ", Baby Semi First, 'this is a Semi camera called Baby'), an article by Furukawa Yasuo (古川保男) in Camera Collectors' News no. 277 (July 2000). Nishinomiya: Camera Collectors News-sha. P. 27. Type 3, section 6B. "Kokusan shashinki no kōtei kakaku" (国産写真機の公定価格, Set prices of the Japanese cameras), listing Japanese camera production as of October 25, 1940 and setting the retail prices from December 10, 1940. Published in Asahi Camera January 1941 and reproduced in Shōwa 10—40nen kōkoku ni miru kokusan kamera no rekishi (昭和10〜40年広告にみる国産カメラの歴史, Japanese camera history as seen in advertisements, 1935—1965). Tokyo: Asahi Shinbunsha, 1994. ISBN 4-02-330312-7. Pp.108—9. Type 3, section 6B. Asahi Camera (アサヒカメラ) editorial staff. Shōwa 10–40nen kōkoku ni miru kokusan kamera no rekishi (昭和10–40年広告にみる国産カメラの歴史, Japanese camera history as seen in advertisements, 1935–1965). Tokyo: Asahi Shinbunsha, 1994. ISBN 4-02-330312-7. Item 38. Awano Mikio (粟野幹男). "Semi Orinpasu II" (セミオリンパスⅡ, Semi Olympus II). In Camera Collectors' News no.209 (November 1994). Nishinomiya: Camera Collectors News-sha. Kamera no mekanizumu sono I: "Hai! Chīzu" Shunkan o torae-tsuzukeru shattā-ten (カメラのメカニズム・そのⅠ・「ハイ！チーズ」瞬間をとらえ続けるシャッター展, Camera mechanism, part 1 "Cheese!" Exhibition of instant taking shutters). Tokyo: JCII Camera Museum, 2002. (Exhibition catalogue, no ISBN number) P.21. McKeown, James M. and Joan C. McKeown's Price Guide to Antique and Classic Cameras, 12th Edition, 2005-2006. USA, Centennial Photo Service, 2004. ISBN 0-931838-40-1 (hardcover). ISBN 0-931838-41-X (softcover). P.747. Sugiyama, Kōichi (杉山浩一); Naoi, Hiroaki (直井浩明); Bullock, John R. The Collector's Guide to Japanese Cameras. 国産カメラ図鑑 (Kokusan kamera zukan). Tokyo: Asahi Sonorama, 1985. ISBN 4-257-03187-5. Item 1215.